In the grand scheme of things, where does the issue of appropriate fire safety fit within the conceptual design of a building? In all probability it may not always sit at the top of the client’s priority ‘wish list’ of key considerations, but should it? Any building design will start with a client vision from which the architect, structural engineer and, increasingly, the fire engineer will need to convert the client’s aspirations into a practical and functional design that can be constructed within the client’s budget. Long gone are the days when a designer was shackled by the constraints of prescriptive fire codes, leaving today’s fire engineer free to model alternative solutions that will satisfy the relevant national building codes. To protect the building and its contents from a fire? In reality the two approaches will result in very different fire safety solutions. If protecting the building itself from fire is not seen as a concern, then it can be designed to meet the minimum building codes required to ensure safe evacuation. In contrast, designing to protect the building and ensure safe evacuation may also determine whether, post fire, there is a building/business to return to at all. The most recent fire statistics for England a Wales show there were less than 300 deaths in building fires in 2013/14, and, of these, the majority took place within dwellings. However, it is generally believed that over 40% of businesses are out of business within twelve to eighteen months of a fire, not only leading to substantial insurance losses, but often resulting in unemployment, which in turn may have a major impact or knock on effect within the local community and its economy. To ensure the client’s needs are met, the designer should clearly explain that the requirements in the Building Regulations are not aimed at protecting buildings or the businesses within them, but only at ensuring minimum life safety standards. He should also explain that there are a range of factors that impact on the success or failure of a fire safety strategy over the lifetime of a building. Other key considerations include fire engineering, fire safety enforcement, progressive developments in modern methods of construction, and appropriate ongoing fire risk assessment. Fire safety therefore is made up of many disparate disciplines, not always working in as joined up a way as may be assumed, leaving all those involved in such processes to ensure that the client’s initial aspirations within the original brief are met. 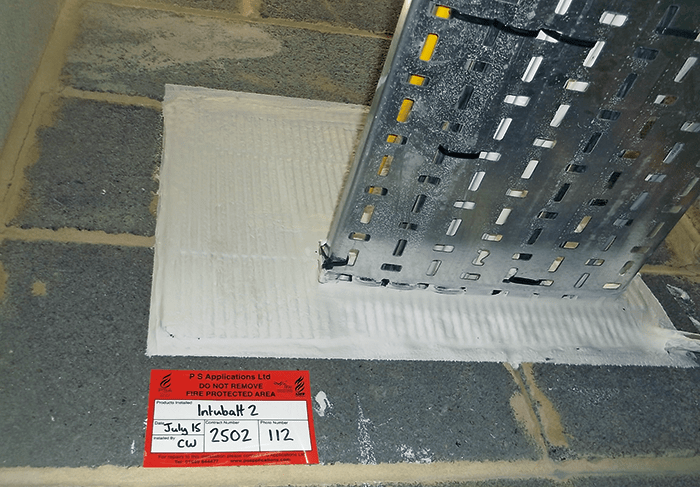 Passive fire protection installation must be undertaken by competent installers. Image courtesy of ASFP member PS Applications Ltd.
What is the maximum acceptable damage value? Should any fire be contained within a defined compartment area? How quickly should the fire be extinguished from the time of ignition? How quickly should the building be reoccupied or trading? A Building Control Authority will approve a fire engineered design provided that it complies with the minimum fire code requirements for life safety. This does not mean that the building will be protected from fire, or that any attending fire service will attempt to save the building where there is no threat to life safety. Only by including additional measures recommended by the client or his insurer will protection of the building and its contents more likely be assured. One of the key aspirations in the commissioning of any building nowadays is one of thermal efficiency and carbon neutrality. The designer now has a wealth of building materials at his disposal to meet such ‘green’ credentials. But a key consideration that must be addressed is how well will these materials perform in a ‘real fire’ scenario. The product /system supplier can demonstrate by defined national testing standards (and not simply a small scale ad-hoc test), that the product or system can evidence appropriate performance in the conditions outlined within the building design chosen. The installation of such products or systems is undertaken by competent installers who can demonstrate such competency via a third party audited process. In the UK, this would require a contractor to have gained third party certification via a UKAS accredited Certification Body. Building design will start with a client vision from which the architect, structural engineer and, increasingly, the fire engineer will need to convert the client’s aspirations into a practical design. Image courtesy of ASFP. The design and construction of a building is but the start of the process. How the building is subsequently managed and maintained will prove vital in terms of maintaining the designer’s or fire engineer’s perceived fire strategy. How well a building owner understands what may well be complex fire engineered solutions will become vital to ensuring that the building is managed and maintained to ensure that the fire performance of a building remains fit for purpose. Just over a decade ago, the ASFP took the lead in a Government-sponsored programme where independent research on fire safety provisions in a wide variety of nominated types of buildings was collected. In the vast majority of buildings inspected, a high percentage of compartment walls were either defective, through poorly installed fire stopping of penetrating service systems, or invalidated by incompetent maintenance, or worse no fire protection measures at all. It follows that for any fire engineered building to continue to perform its designed function, it is essential that the fire provision of the building as a whole, is maintained adequately throughout its entire working life. This will require regular assessment by a competent fire risk assessor, the frequency of which will be dictated by the building’s risk profile. It is important to ensure that all activities within the building that might affect its fire performance are monitored and responded to where necessary. This is essential when allowing follow on trades to undertake work that may for example, breach the building’s compartmentation. Whilst it should be expected that any follow on trade is vetted to ensure that they are competent to undertake the work in hand (e.g. the installation of new telecommunication cabling), it should not be assumed that they are competent in terms of how to breach and reinstate the fire compartmentation provision. Damage to the compartmentation can significantly compromise the intended fire provision of a building, leaving the expected fire performance in question. Those involved in the provision of fire protection, at any level, share liability for its usefulness and its operation when needed in fire, and that liability will still be there in the event of a court case. If it is your responsibility to specify the materials and/or appoint the installation contractor, it is also your responsibility to ensure that they can prove competency for the fire protection materials used, or the works to be carried out. For the building owner, it is their responsibility to ensure that any installation of the fire protection provisions within a building is undertaken by those with sufficient competency. The Association for Specialist Fire Protection’s (ASFP’s) Guide to Inspecting Passive Fire Protection for Fire Risk Assessors offers essential guidance to building owners and risk assessors, while Ensuring Best Practice for Passive Fire Protection in Buildings defines the roles and responsibilities of professionals with responsibility for the fire safety of a building throughout its lifecycle. It includes advice for the client/developer, designers, main and specialist contractors, manufacturers, suppliers, regulators and enforcers, as well as the building occupier. 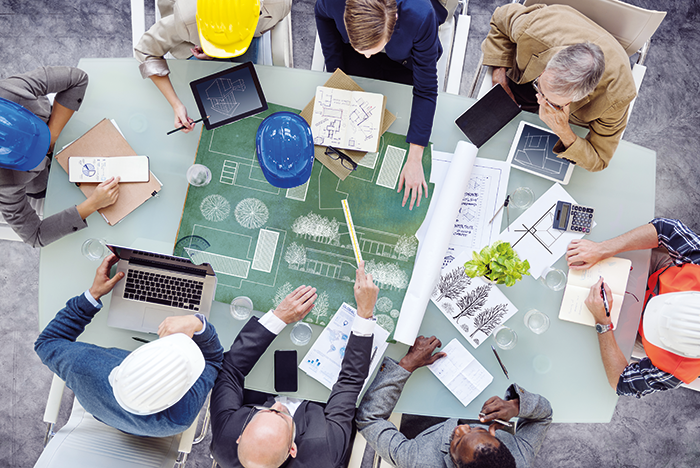 Turning aspiration into a reality is not an easy science, particularly when one considers the plethora of issues that needs to be considered during the design, construction and management of a building. Whilst the life span of a building can be measured in decades, its journey from construction to demolition may be tested at any stage in terms of its fire performance. Should such an unfortunate occurrence take place, then that initial briefing between the designer and the client will prove vital in terms of how the building responds, and whether there is a business to return to. Wilf Butcher is CEO of the Association for Specialist Fire Protection. Should the Fire Industry Compromise on Touchscreen Technology?